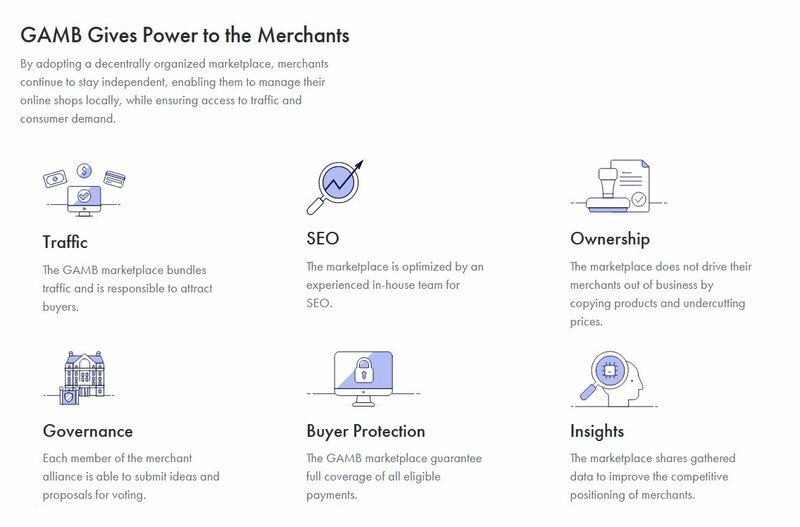 GAMB (the Global Alliance of Merchants on the Blockchain) is a project with the goal of developing a decentrally organized, blockchain-based marketplace. Merchants selling on the platform will be able to actively participate in order to create a more sustainable and fair environment. The problem GAMB is trying to solve is the ongoing centralization in global e-commerce. The dominating position of Amazon & co. allows them to dictate prices and terms and conditions to use their services, factually subordinating merchants across the globe. It is becoming increasingly hard for smaller merchants to compete with Amazon outside their platform; while selling on Amazon is expensive and always carries the risk of being pushed out at any moment. Amazon is holding all the cards: they have all the data from both customers and merchants and can use them to find the best strategy for themselves. In the end, the merchant is nothing more than another customer to Amazon and is reliant on their mercy. The solution for this situation is as easy as it is revolutionary: a decentrally organised, transparent marketplace that on the one hand offers its merchants all the advantages like traffic and access to consumers, and on the other hand offers them real participation in all decisions regarding e.g. fees, new features or partnerships. This is designed to guarantee that merchants can sell and grow within the platform without pressure or anxiety. All this is enabled by the underlying blockchain technology, that guarantess absolute trasparency and immutability of records. The level of trust thereby createwd between all stakeholders is the foundation for the growth and progression of the platform. If you want to know in detail what GAMB is planning to introduce, you can check them out on their Website, the Whitepaper oder on Medium. The project is currently raising funds through an ICO. More than 10 Million USD have already been raised. As soon as the Hard Cap of 30 Million USD is reached, the ICO will end and the funds will be used, among other things, for the development of the platform. All the details are again available in the Whitepaper. What is Gambio’s role in all this? If you take a look at the GAMB website, you will notice a lot of familiar faces. Nevertheless, GAMB is not a Gambio-project. Gambio is supporting GAMB, yet it will not be responsible for the development and operation of the marketplace. If you have any question concerning GAMB, the ICO or the marketplace, we would be thrilled if you ask them in the GAMB Community on Telegram. The admins are available 24/7 are happy to help! Create your own onlineshop today! Dieser Eintrag wurde am Donnerstag, Juli 5th, 2018 um 15:00 Uhr in der Kategorie Allgemein veröffentlicht. Sie können alle Antworten auf diesen Eintrag durch den RSS 2.0 feed verfolgen. Sie können darauf antworten, oder einen trackback von Ihrer eigenen Seite setzen.